Festive Funnies: BLACKADDER'S CHRISTMAS CAROL | Warped Factor - Words in the Key of Geek. What we have here is the anti-Christmas Carol, and an idea so simple yet so genius it could've only been dreamed up by the Blackadder crew. If all people sincerely practiced good will toward others and businesses only marketed their goods to spiritually enlighten their customers during the Yuletide season, then Blackadder's Christmas Carol would've been pointless and repugnant. But since at Christmas time many people only behave nicely in order to impress others and businesses peddle their latest range of junk for maximum profit, what could be a greater relief from all this humbug than a reverse Scrooge story about "the nicest man in England" who after seeing ghostly visions on Christmas Eve, becomes "the horridest man in the world." Even if you've never seen an episode of Blackadder (and why not?) and are unfamiliar with Rowan Atkinson as the scheming, sharp-witted title character, alongside Tony Robinson as his moronic assistant Baldrick, you can most definitely still enjoy this Christmas special. 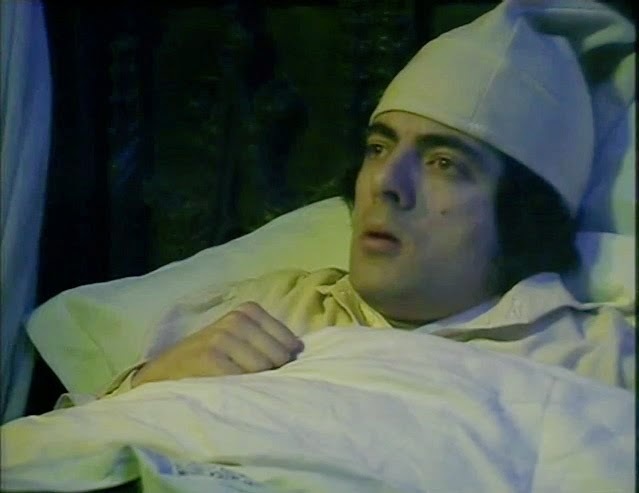 Much of the appeal of Blackadder's Christmas Carol is the turning of the worm theme. 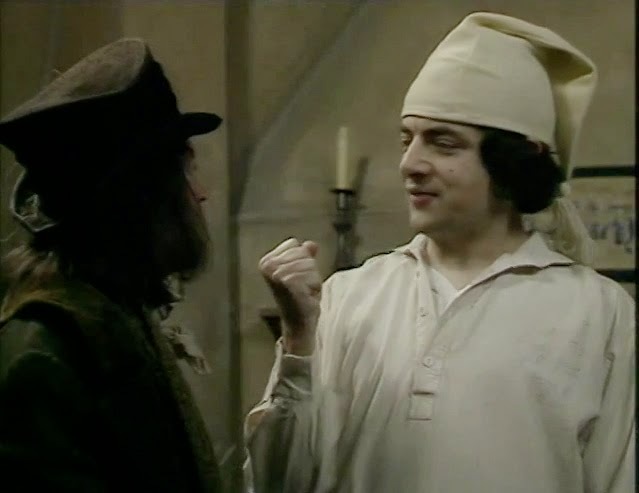 Because, totally against type from the character we are used to, the pre-visions Ebenezer Blackadder (Atkinson) is thoroughly sweet and generous. He is an easy pushover for avaricious hangers-on, and also seems repressed by his saintliness. Therefore the transformation of Blackadder, after witnessing the humorously despicable behavior of his ancestors and descendant (also played by Atkinson), is not only cathartic but thoroughly convincing. He effortlessly and buoyantly expresses his meanness toward his tormenters, so much so that you are convinced that Ebenezer hasn't actually changed, rather just shed a facade in order to divulge his true nature. Now we have the Blackadder we've been accustomed to. Abusing Baldrick with his Christmas gift, "I've made you... a fist! 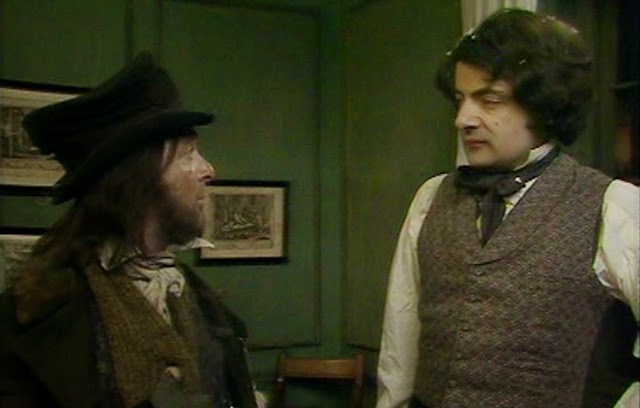 ", followed by "Think nothing of it, Baldrick- I, after all, think nothing of you.". Blackadder then sets about delivering a quick fire series of hilarious insults to those around him - "Mrs Scratchit, I've always found you foul. And more than a little." So is benevolence, not misanthropy, the key to true happiness? It does seem that "bad guys have all the fun" so maybe it is. Either way it's a wickedly funny 45 minutes featuring first rate performances from the likes of Robbie Coltrane as the fumbling Christmas Spirit, Jim Broadbent as a dense Prince Albert, Miriam Margoyles as Queen Victoria and the regular Blackadder stalwarts of Stephen Fry, Hugh Laurie and Miranda Richardson. There's even a small cameo for Nicola Bryant as Blackadder's goddaughter Millicent, complete with an eardrum shattering laugh! The dialogue is witty and sharp throughout, as you'd expect from Richard Curtis and Ben Elton, and although it can be enjoyed at any time of the year there is something quite special about spending Christmas Eve watching a traditional take on A Christmas Carol and then following it up with this. "Mr. B! Where's the milk of human kindness?" "It’s gone off, Baldrick. It stinks."